Right here in Hamilton I'm surrounded by art. Obviously we have art promoted to the masses, through the AGH or the James North Art Crawl to name a few. But wander down the right street or alley and you're faced with art on a larger scale and with definite purpose. 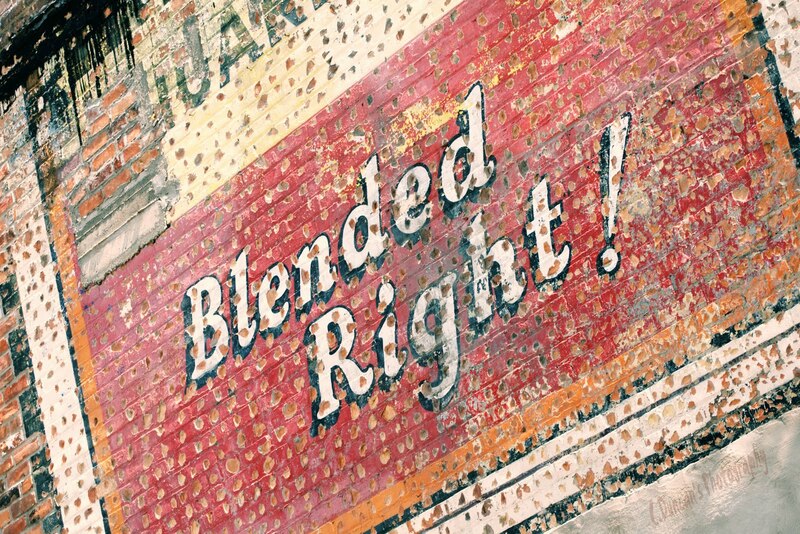 Ads painted on the sides of retro cafes, old factories, and mom & pop shops will always stop me in my tracks. Always. Think about all the design work and branding, the use of color to draw your eye up way above the street, shapes that cause you to slow down to take it in better, and perfect text and wording to make you remember it long after you've moved on. Art at it's most practical, but art none the less. And sometimes it's tricky to get the right shot of it. Usually the buildings are very close together in the downtown core, lighting is either harsh or almost nonexistent due to all the tall office buildings crowding out the sky, and if you try to shoot from across a city street you've got power lines and stop lights galore. You either find a way to make it work, or you walk away. This was my dilemma last week when I was out on a walk downtown. I loved this wall. Who wouldn't? Great texture, great color, and aging nicely. But the street is tight, a fence keeps you out of the side alley, and the trees that shade the stores in front keep you from getting the entire sign when you move back. These are the days I wish photoshop applied to real life, cause I'd cut an' paste this sucker into a much easier location to shoot from if given the chance. Maybe there's an app for that? Anyways, as I stood there trying all sorts of things to get a unique enough shot in the small amount of time I had, people passing me started slowing down to see what I was staring at, and so to avoid the unavoidable, "hey, you wanna take my picture sweetheart?" that always comes from some guy or other sitting on a step having his first drink of the day, I aimed the camera from down at my side having already set my exposure and shot part of the sign at an angle. Looked into my view screen, liked what I saw and moved on. Being female, and often out on my own, I've become very skilled at moving on. Not drawing attention to myself or my gear. Not taking very long to work a shot. Assess the subject, think hard about what I like, and get the shot. And what do you think? Think it worked okay? I like it. In fact I may do a series, as this is not the first signage I've shot. This shot taken a couple years ago remains one of my best sellers. And I'm very much in city mode lately. Not sure why. But I like it. So Google, Yahoo, Apple, and the rest of you... wanna get crackin' on that location transportation device app for photographers? Thanks. I know it'll be the next big thing eh. Thanks for the ramble, and have a great Telephoto Tuesday folks! The First of Many ~ Mono Monday! Can I just say how much I love downtown Toronto. I spent twelve hours there yesterday, just me and my Nikon. And I was in heaven. Well, as much in heaven as one can be when the skies are flat grey, the humidity was sitting at 86% and I'd inadvertently left my spare battery at home in the charger. I was in TO for the annual Doors Open Toronto festivities. 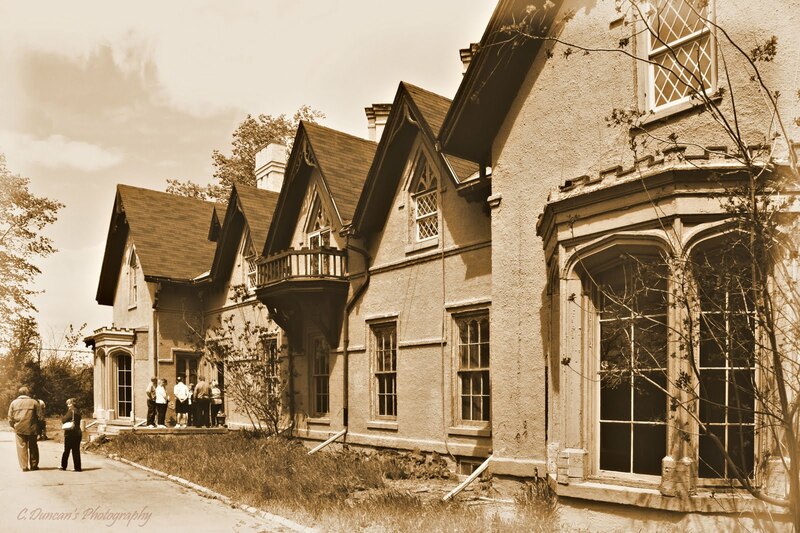 Doors Open happens all across the province at some point in the year, and it allows the public glimpses into the more private and historical properties for free. It can be a photographer's paradise. You just have to fight to get shots all the other hundreds of photographers are trying to get at the same time. You can almost hear all the creative gears turning as photographers eye each other and their respective gear trying to guess what the others might be seeing that they're not. I've learned over time to tune everyone out, and just enjoy exploring. My first time wandering a location feels overwhelming. I almost didn't know where to start aiming the camera. But because I know that the first go 'round feels like that, I simply payed attention to the things that stood out, and made plans to return as soon as possible. Also, the hours of DoTO leave little to be desired, they pick midday hours, the worst time of the day to shoot anything. There's a reason they tell you to return over and over to a subject or location. The more familiar you are with it, the more you can creatively decide what it is you want to photograph, and how you'll go about it. It just can't be done in one visit, realizing of course that there are times you only get one chance at it, and you must always make the best of it. I've posted a very quick edit today, from yesterdays ramble. I love the University of Toronto's campus architecture. Let me say that again. 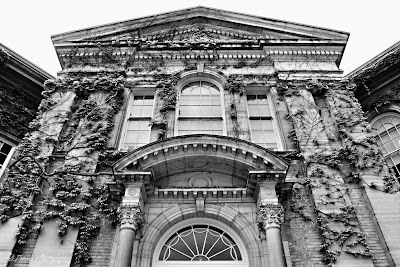 I LOVE the architecture on the U of T campus. Beautiful, historical buildings where brilliant minds are allowed to flourish. I was enchanted. Above is Simcoe Hall, the office for Convocation and is attached to Convocation Hall proper. As I took this shot there were many recent grads having family pics taken around this important and celebrated building. In other words, I was left aiming upwards, which as you should know by now suits me just fine. I will definitely return in more interesting light to photograph this building. Classic ivy covered architecture from 1924 is always worth a repeat visit. This shot was towards the end of my visit and was followed by dinner at a wonderful bistro, bustling with people relaxing at tables along the sidewalk, in the company of my own brilliant and talented brother who resides in Toronto and would be the first to agree that TO can be very enchanting. And not to forget the incredible Grilled Chicken Penne I devoured after 8 hours of photography. Mmmm. Yes, this visit will be the first of many. Thanks Toronto for the fabulous chance to ramble through your streets! I will post more from my day in TO through the coming days on the blog. Have a great day gang! I love photographing the city. I've said that before. So when the chance came this week to head out with the camera I made a decision to leave my wide angle in the kit, and only use my telephoto. No matter what. Why? Because limiting myself to one lens forces me to look at things differently. That limitation brought me limitless opportunities to be creative. It was energizing! My wide angle is my go-to lens for so many subjects and scenes, that I sometimes forget I have other lenses in my bag. I get comfy. Or perhaps more accurate is that I get lazy. So once in a while, to break out of the routine I keep placing myself in, I try exercises like this one. I either limit myself to a type of gear, or I limit myself to a central theme. I should know never to be surprised at how fun and varied the results are. The shot above had all the things I like in a details shot. 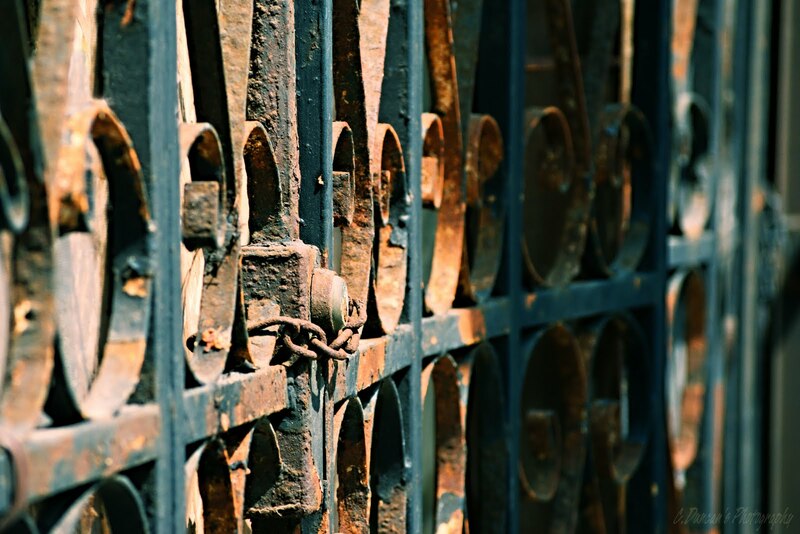 Rusty, weathered iron gates across a defunct storefront. A big ol' lock that would never turn now for a key, and difficult light adding to the urban decay feel. I pumped the color cast a bit in Nik Effx plug-in Brilliance/Warmth while in PSPx2. Then it was done. And I'm pretty pumped about the other gems I'll have for the coming weeks too. Put a limit on how you shoot, and force yourself to think more creatively. 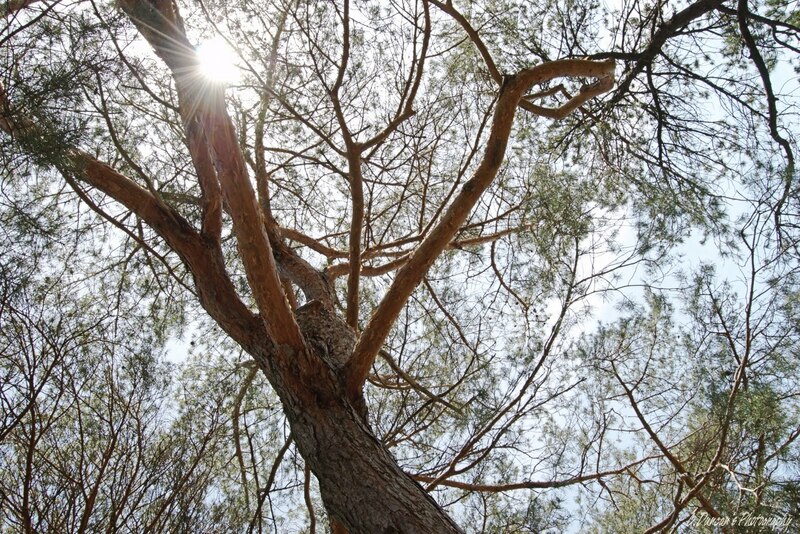 The possibilities for great shots that express how you see things around you are limitless! "From the Earth to Your Table"
Picking up where we left off yesterday... composition matters. Walker Evans was quoted as saying, "Shoot whatever and however you want. Don't listen to anybody else, just go in the direction you've chosen. But you need to look before you see!" How are you choosing to look for subject matter? Are you limiting yourself? Or coming away with images that feel like they contain everything but the kitchen sink? In the past when I've felt like this, and don't know what to work on fixing first, I've gone back to the Elements and Principles of Design and tried to pick one that seems to be lacking from my images overall. Then I go out on a shoot with that foremost in my mind as I look for a scene or subject that will help me define it. It sounds methodical but it gets the creative juices flowing and helps you target elements so that you naturally start to recognize them over time. And you start to think outside the box. Today's image isn't a phenomenal work of art by any one's standards, but it helps me close in on the other elements and principles I couldn't cover yesterday without my brain exploding! That, and I like purple. But I digress. Now, there are elements from yesterday's chat in this image to be sure. Can you see them? I hope so. But along with those, I tried to get a shot today that helps give a visual clue as to the other elements to be discussed. They are form, value, and size. This image had some really definitive light considering I took it very late morning. Because the light was slightly to the side, it created shadow and highlight... and they help define a subject as being dimensional as opposed to flat. 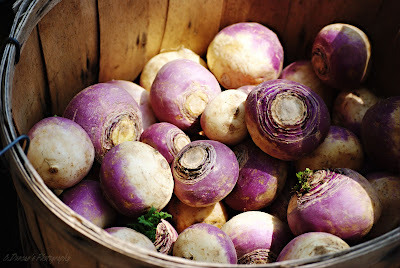 This is the importance of form, you realize there is depth to the basket and it contains a pile of turnips, nice and round, instead of looking rather 2D and uninteresting as a result. The light this morning also adds the element of value... a range of lights and darks, helping to define your composition further so colors and shapes are left looking stale. And let's not forget the use of size. When looked at closely, there's a variety of sizes that causes you to look around the rest of the image, taking in the few that are different or uneven in appearance. Isn't it amazing that the brain registers all of this without you asking it to. And you may wonder if we really need to know any of this in the long run, but how else will we be able to recognize when a photograph lacks impact of any kind, or that we've been stuck in a rut? As for the principles shown here, besides a couple from yesterday, there is a very obvious center of interest here. A very tight shot of the turnips, a lot of turnips, leaves no doubt of what the center of interest is. (I'll give you a hint, it rhymes with lurnip...) And color aids in this as well, as they are all uniform in color which draws the eye. Also, there is the way I've used the principle of balance. I've composed do that you know the basket and pile of turnips are round, yet you needn't see all of it in order to come to that conclusion and my asymmetrical composition adds interest instead of centering the entire thing in my lens. Whew... dissecting a shot is harder than it looks! My head hurts. So there we are. The building blocks that naturally occur within great compositions, and now that we know what to be on the lookout for, great compositions will be a little easier to produce. Thanks so much to all the folks who already know this stuff and are just tuning in to see the shot for the day. And thanks to the few of you i heard from that have enjoyed learning more about how design influences composition. At least how it does subconsciously somewhere in my own noggin as I frame up a shot. Scary huh. Thanks for the lengthy ramble gang! Have a good one! Closing In On Design ~ Telephoto Tuesday! Whew. Where to start today? 'Cause I've been challenged to take on a big topic! Composition. Now, I wasn't exactly double-dog dared or anything quite that serious, but when I say I'll do something, I like to follow through on it. So here we are, on my 100th post no less attempting to share my thought process when I'm considering composition. This might be one wild ride. Here we go. Because of my art background, Elements and Principles of good design have been lodged in my brain from an early age. And you should become familiar with them at some point, you'll see your images improve. I tend to lean towards looking for good line, shape, texture, and color automatically as I look around me for subject matter or interesting scenes. These are the elements that people are most familiar with whether they know it or not. The other elements (to be broached tomorrow) are size, value, and form. The image today has the first four elements prominently used here. Repetitive shape immediately gets your attention, then you'll notice lots of lines taking your eyes up, down, and across respectively. Those lines on the roof allude to smooth cool textural details, and we also see texture in the wire over each dove cote, not to mention the single cote with the texture of the only nest inside in the bottom right corner. Wow, those elements are really hard at work already... and this is why. Combined, they contribute to principles of design needed to make your composition work on a new level. You mean to say there's Principles of Design too? I warned you this could get wild, *wink*. Look again at today's image. When you really look hard do you also see balance, contrast, harmony, and rhythm? If so, that means that the combination of lines, shapes, colors and textures have worked together to utilize principles of design. Didn't see that one coming did you? You did? I knew you would. The pattern created by the rows of dove cotes, each one the same color yellow against the slate blue/grey, gives the composition a sense of harmony and rhythm. 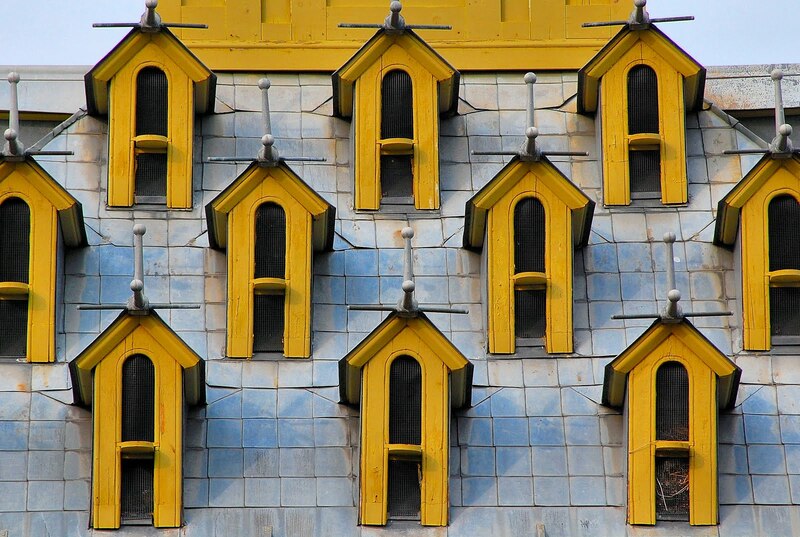 Not to mention balance since I chose to emphasize the symmetry of the roof top, every dove cote evenly spaced. The image pops with contrast because of the shapes dotted out across the composition, and the black of the mesh fronts against the yellow. 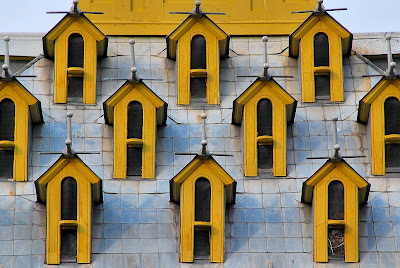 The yellow also contrasts enough against the blue roof. And the textures also contrast nicely, the roof looking smooth and cool, and the cotes textures looking more rough and warmer in hue. Tomorrow we'll try to include the other two primary principles - center of interest, and movement. Still with me? Gosh I hope so. All of that was to say this; most of these things your eye can pick out every time you assess a scene in front of you. Why, because these are things the human brain desires and uses so it can make sense of whatever you look at. When I looked up at the roof of Dundurn Castle's tower, my brain registered that this was the prominent feature for very practical reasons... and the artistic side of my brain took over, assessing if it was aesthetically pleasing to look at over and over. Certain things began to assert themselves and I was careful to compose around them in the best way I could. Of course, you don't have to concretely think these things every time you raise your camera... after a while, from shooting and composing long enough, this all becomes second nature. The more you look around you, the better you'll see engaging compositions no matter what the subject matter or where you are. I recommend always taking time to look through your picture files. Single out the images that stand out as being stellar compositions or just seem to have a wow factor. Compare what elements worked together well. Decide which principles had to be used to make the composition come together too or best portrayed your personal vision for that photograph. It's your personal vision that brings it all together and makes it meaningful by the way. In the end, perfect composition can only do so much. There needs to be some soul poured into each image too... perhaps more important than all the rest. Hey, we did it! Day one on composition is done, with day two to come! Thanks for the very specific ramble gang! Hope I didn't let ya down! Have an awesome day folks... now get out there and think about seeing great compositions wherever you are. Not So Random Trees ~ Mono Monday! Someone asked me the other day why composition seems to come so naturally to me, while they struggle with it daily no matter what they aim their camera at. It took me a while to sort out an answer, and I still don't know if it's even a remotely intelligent one but I gave it my best shot. "Firstly," I said, "we need to clear something up. Composition doesn't 'come" to anybody, naturally or otherwise. You have to be on the lookout for it. I call composing in the lens 'containing the chaos'. Creating order in the lens from subject matter that initially captivated some part of you, the photographer. Secondly, being careful about how we word the concept of composition is key here. Two things have to happen if you want to size up things compositionally. You have to understand elements of design, and be able to see the prominent elements in whatever scene you're viewing... but you also have to be able to decide if they help accomplish whatever purpose you had in taking that photo, whether it was to provide a story, emotional responses or simple information. And to be so aware of what makes up a great composition, that eventually the process from seeing to photographing becomes as easy as breathing. Some of us need more time getting to that point than others that's all." this could be a good challenge. 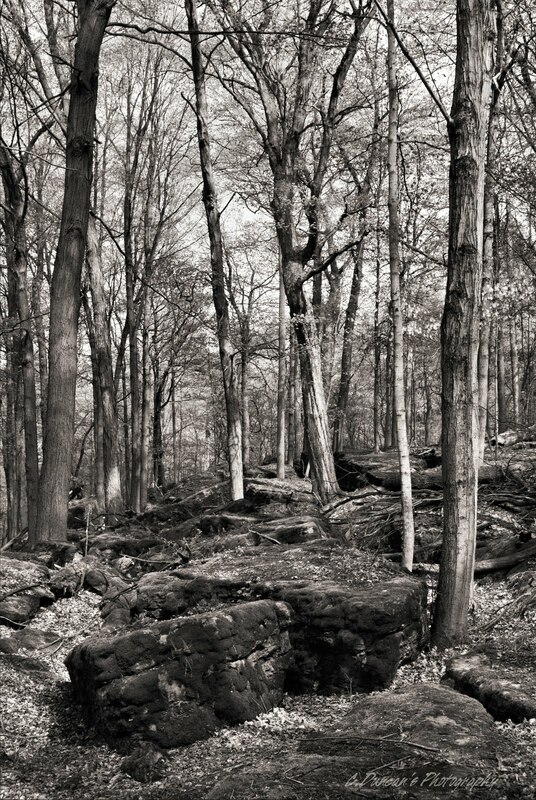 As for today's image, I love the challenge of photographing the nature trails in the area. Finding a solid composition within the forest layers. Those aren't just random trees I decided I liked framed. 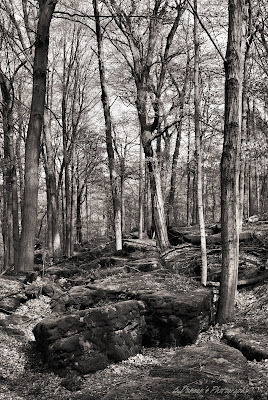 The forest floor climbs and weaves into the scene in the foreground, the trees are fairly uniform in shape and size and have light patterning across them, and they seem to surround the one piece of karst giving it proper emphasis. It has interesting tones throughout, some nice contrasting shadows, and feels very solitary. And I knew this type of composition would translate into B&W well. So, coming up next... examples of design and composition, and my favorite ways to use them in a photo. It won't be anything mind blowing, won't win me a Pulitzer by any means... but you get to step into my brain. If you dare. Thanks for the ramble, and have a good one. "In A World of Her Own"
Since I was away from the blog yesterday, I thought I'd combine florals and experimenting today. Ever look into a tiny raindrop and a whole new world or scene seems to be contained within? Well, I have and it's usually while I'm out in the garden after it's rained. It's right around that time that I begin wishing for a macro lens or fish eye lens to magically appear on my camera so that I can try valiantly to reproduce that. So far the lens fairy's been a no show. So what to do, it takes a week for a rented lens to arrive in my area, and sometimes I just want to get the overall effect without the cost that goes along with renting or buying... in steps PaintShopPro x3 to the rescue. I get to take an image like the one below, a fine image in it's own right, and pop it into the distortion lens effects menu option after I've done any editing to it I wish. I rotate the image's distortion in the fish eye selection vertically and horizontally till the composition is pleasantly filling the sphere. And then I save it. Magnolias in a rain drop. This is why the digital darkroom can be so delightful. You can create art that mimics photography without loosing a sense of what was so magical about the image in the first place. As it is, this image was primed with a conversion into Corel's Cross Processing filter and then a Colored Edges Outline option, so as to give them some bright definition, emphasizing the full sun. All in all, it gave me bolder color, something I feel works for this shot... remembering that every once in a while, it's great to play in the darkroom! And that flowers still rock as a photography subject! I love Floral Fridays, how 'bout you? Have an awesome long weekend Canada! And thanks for the ramble everyone! Into the Sun ~ Wide Angle Wednesday! Have been feeling under the weather today so this will be more "short and sweet" than normal. Trees for me have a mystery about them right now. I'm in love with this elderly Scots Pine at the RBG posted above. In fact, I think any tree's line, and shape, and texture are fascinating in spring. 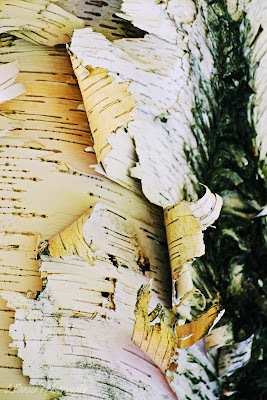 Leaves have yet to bloom fully, so the full light can hit the gnarled limbs, the papery bark texture, and you can photograph their shape in warmer light than in winter. The trick is to find an angle and create a composition out of the chaos of branches and trunks... and it's not always possible, but when you do find a tree that seems like some ancient sculptor carved it out of some equally ancient material, then you work all the harder to present it as whimsically you can. I ensured I got the high sun into the shot, displaying it's dainty star burst in tandem with the rough tree. Something draws me to it every time. Even as I hack up a lung. Where'd I put my lozenges? Me, Myself and My Lens ~Telephoto Tuesday ! "As If Out of a Dream"
Bright light is a must if using the telephoto lens I have if there's anything even remotely close to a breeze. And Ontario seems very windy this spring. When zoomed in close on tiny flowers, I do all I can to make it work fast enough to eliminate blur because the closer and tighter you get to your subject, the longer it takes to get the shot, even opened up to a wider faster aperture.. It is not a very fast lens. But you work with what you have right?! 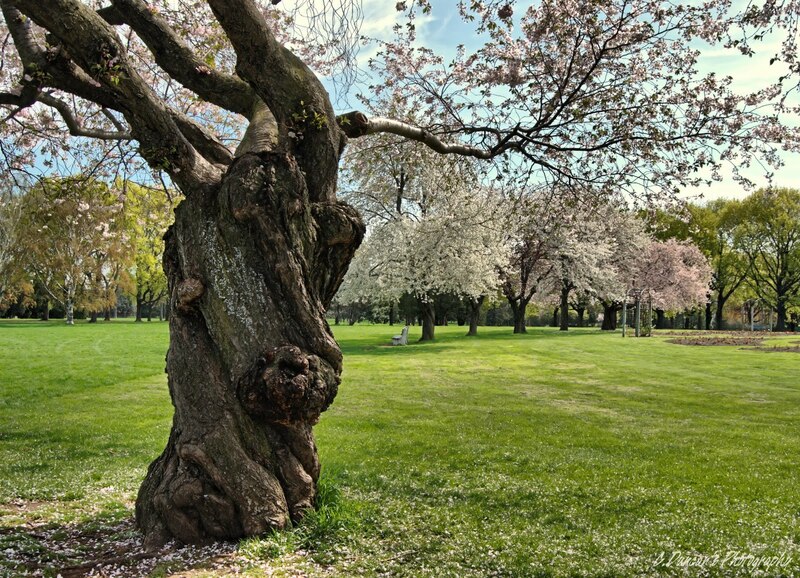 Last week gave us some sun, and so I specifically went out to get cherry and apple tree blossoms at the nearby park. 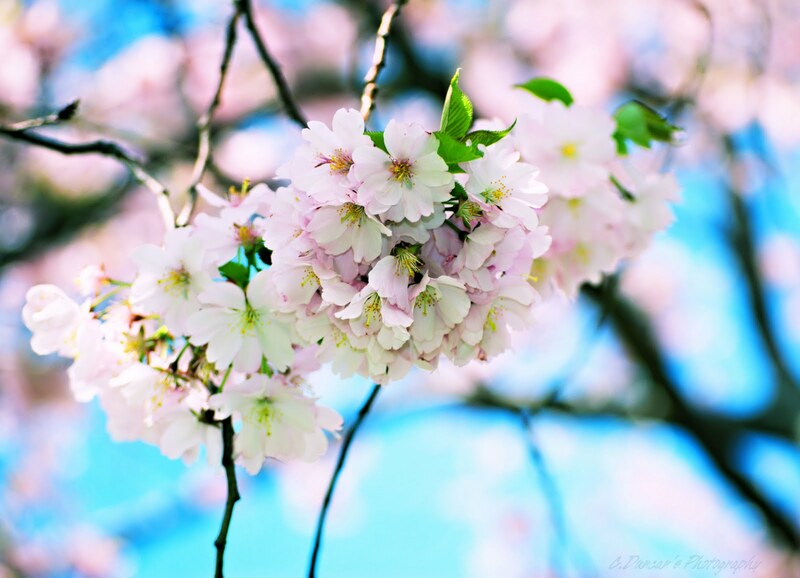 And my telephoto lets me get the prime blossoms farther up into the trees. The shot today was one of those perfect blossoms, totally isolated from the rest. What I do love about my rather mediocre telephoto zoom though, is it gives some lovely DOF at it's larger apertures, even in bright direct sun. I can open her up to an F/5, and get a perfect soft background. And instead of blowing too much of the shot out, things have a glow where the light hits. Then the only trick is to watch the breeze, and when I sense it dying down before another current comes along I steady the camera and snap the shot. 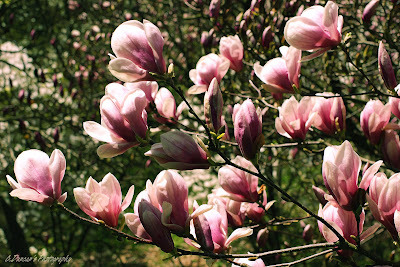 For this one, since the light was more or less behind the blossoms, I also used some fill flash. It helps to freeze any motion from the slight breeze and balanced out the light underneath the flowers. There were a lot of tries before this one worked. We'll leave it at that. And since I have other purchases as top priority, a fast telephoto (gosh, most priced for an arm, a leg, and your first born) is at the bottom of the list for now. So, it's a case of working the best with what I already own, knowing it's quirks and flaws like the back of my hand, and still producing images that will excite me, and hopefully others as well. I guess what I want to say is know the limitations of whatever gear you have and work with it. It'll make you a better photographer. Usually more than replacing the lens will. Thanks for the ramble folks! ... And have an amazing day. Can't See The Forest for the Trees ~ Mono Monday! "A Whisper Off the Beaten Path"
Still using images this week from my personal challenge. Last week I mentioned tightening my focus. Breaking down the bigger picture I'm usually prone to seeing. Not to say that there's anything wrong with the bigger picture if it speaks to you, and is so powerful it moves you. But sometimes you look back over your shoulder on your artistic journey and realize you're just following the exact same trail over and over with the same results. If growth is your destination, better switch your approach. And the photographer or artist who can recognize that for themselves will find ways to make that happen, and find inspiration along the way. When I saw today's subject, I knew two things instantly. The first, that the final image would be B&W. There was a bit of sidelight, which enhances texture and outlines shape wonderfully for a mono shot. Second, and more importantly, that the tree alone, was the subject. This is rare for me, since my tendencies run towards using trees to fill out the scene of a landscape. Basically I use them as filler. This time, I got my camera as low as possible under the tree that hangs over onto the trail below. From a few inches off the forest floor I tilted my D80 upwards to stretch the perspective as much as the kit lens would allow. This allowed me to include the root system that runs over and through the bed of karst throughout the trail. In fact, when I return to this spot, I already know I'll try to scootch even closer to the gnarly base and shoot up. For a more extreme perspective. But hey, baby steps right? Thanks for the Monday ramble gang! And for journeying along with me as I grow again. And for being so encouraging with your emails and comments and tweets... have a good one! And maybe spend this week finding a way to break out of your routine. 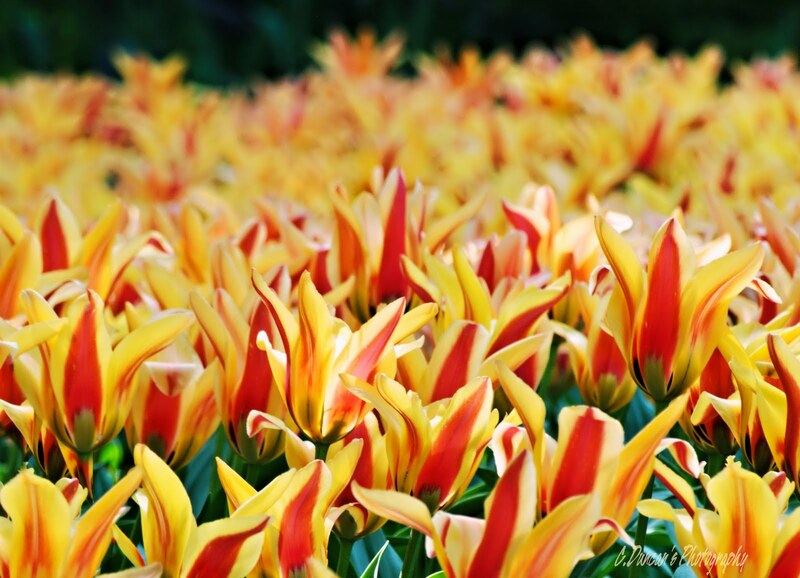 Tulips to the Power of 10 ~ Floral Friday! Tulips. Today's image is from my visit to the Royal Botanical Gardens for the annual Tulip Festival. And boy, the colors are fantastic. This week coming will be the week to visit, as they're just starting to open now. In fact, this past week, many of the shade varieties weren't even ready to pop. So this next week will be ideal. The colors. Ever just take a photo because the scene seems to drip with color, and therefore almost becomes it's own subject. I spotted these variegated tulips across a small pond under the shade of a large pine tree. The bright sun was making it difficult to get many of the patches of flowers that weren't tucked away in some shade, so when I spotted these I pounced. And their sunny color really is the subject of this shot, along with the repetitive shapes, and contrasting reds and greens throughout. Kept my telephoto on so as to get in tight and eliminate the surrounding trees on either side, and to compress the distance giving the effect of a sea of tulips. Filled the frame almost completely for impact. In fact the first few shots I took of these were taken vertically... then I realized they also worked on a horizontal crop. It has less space, filling more of the image. I could have cropped or composed so that I excluded the entire top of green in the background... but I liked how it echoes the greens in the immediate foreground so I left it. With tulips, color is key. Hope you're out there injecting some bold color into your images once in a while. Something that makes you say "wow!" In the meantime, thanks for the ramble, and for waiting for Blogger to come back online. Have a great weekend folks! Cheers! Nature and Design ~ Exploration Thursday! It's so easy to fall into the routine landscape or nature photo approach. Wait for perfect sunset lighting, find an idealistic vista, widen your focal length and include every hill and dale, get moody with weather changes, etc. The danger is that every approach starts to feel the same, and every resulting image echoes the one before. Time to break out of the box. Spent the day yesterday with a great friend wandering local trails, historical arboretums, and celebrated rock gardens with our cameras. My personal challenge this week has been to change my approach to these familiar spots and how I photograph them. I have been reading a book this week by George Barr called "Take Your Photography to the Next Level". A lot of what I've read I knew already, but it was a reminder that much of it I'm still not applying to my craft. Being more consistently on the lookout for design or elements of it in our immediate surroundings. And then photographing it in such a way that it draws the eye regardless of how simple the premise is. Barr's "Rules for Looking" should be in every photographer's kit. To be sure, I got some great landscape shots yesterday. But more importantly, I used my eyes, looked for design in it's most natural form and began to get really excited about the endless possibilities out there. The images today are examples of how all of this has motivated me to look deeper at my subject matter. Less surface clutter, more intentional photography. The image of the Birch bark was challenging. It can tend to look very busy, with extreme contrasts. So I had to use caution when deciding on the comp and the exposure. Watched my histogram carefully to ensure the whites would pop without blowing out. 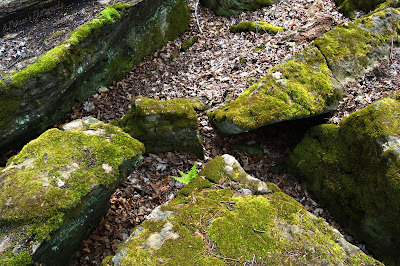 This image of the karst that rims the trails at the Hermitage is my other favorite from my personal exercise yesterday. Shape is a very strong way to make a photo engaging, and when I glanced down at my feet getting ready to hop to a much bigger piece of rock I noticed the way the karst converges together with triangle shapes naturally. Compositions of the forest floor make you stop and look at the cycle nature takes. 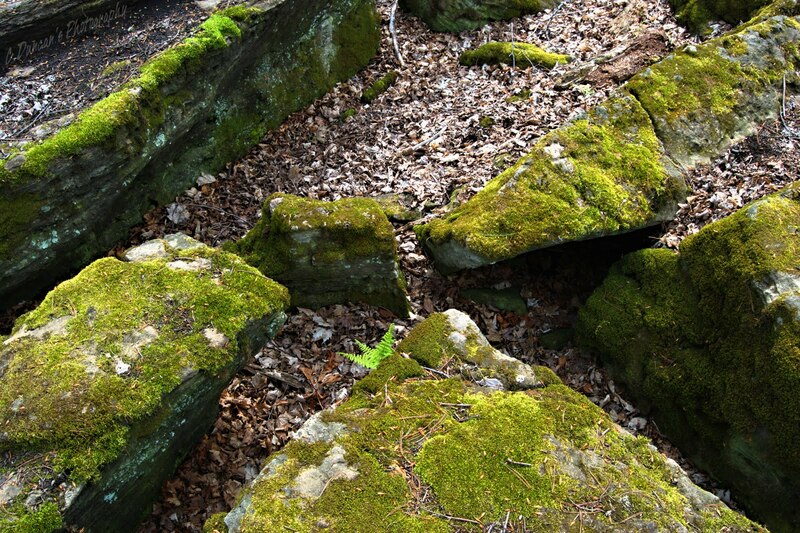 Years of moss along karst shaped by hundreds of years of weather, last years leaves carpeting the surface and home to myriads of critters and fungus. Nature and design working together. And so often we miss it. Hope you're working on thinking outside the norm with your own cameras. Get out there and explore! Thanks for the ramble folks, have a good one! Repeat Performances ~ WideAngle Wednesday! I've spent a lot of time photographing this public park. I won't lie. I've been photographing Gage Park for over 5 years. And I keep returning. You'd think I'd have covered it all by now. But things keep changing, growing, dying off, weathering more storms etc... and the challenge of seeing something new in such a familiar place is one practice I continue, it makes me a more observant and creative photographer. The apple tree above is a perfect example. 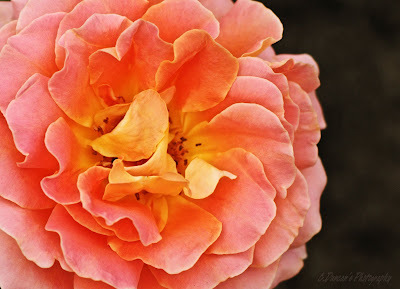 I've always shot the flowering trees lining the rose beds from a vantage point that shows their color. They're the epitome of spring for me. But this year the weather had delayed their blooming and now they're already dropping petals and color in the harsh sun and strong breezes we're suddenly getting in Ontario. The display did not last long. Knowing I needed a new approach anyway, I started to focus on the trees themselves. 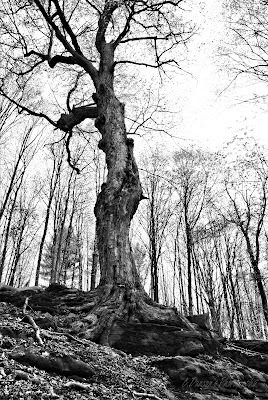 Twisted trunks with withered bark, gangly limbs that spread out low, looking at least 100 years old and very wise. 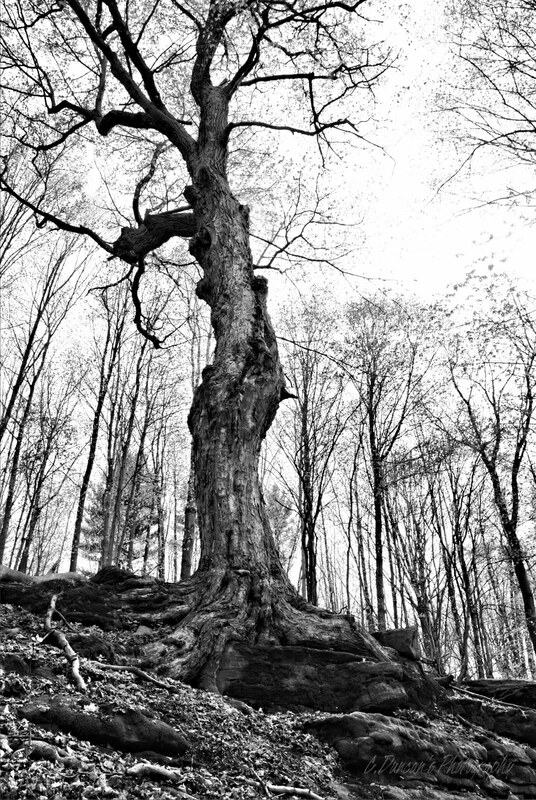 I began to drop down low, shooting wide and upwards using my wide angle to accentuate the spread of the old trees. My point of view gave me a different perspective on why their so interesting, so full of character. And they transform into a scene that could be out in some old orchard instead of a park in the heart of the city. All this took in editing was the Nik Efx plugin called brilliance/warmth and a slight adjustment in curves to bring out darker details on the trunk which the bright sun light was washing out a bit as it got too high in the sky. I believe I'll return to this same spot at sunset and see what the light coming from the opposite side does. The more you revisit a spot, the better you can envision what might be aesthetically interesting. And the more you use a particular lens, the better you'll know what it's best features are for what you're shooting. Repeats and revisits are never a waste. Thanks for the ramble ladies and gents! Have a great day... and put that camera in your hand! Great For Critters ~ Telephoto Tuesday! "Keeping My Eye On You"
Growing up, I always thought I'd be a veterinarian. That's how much I loved animals. Then I discovered being a vet has nothing to do with cuddling them all day and everything to do with working more on their insides... and suddenly being an artist looked real promising. 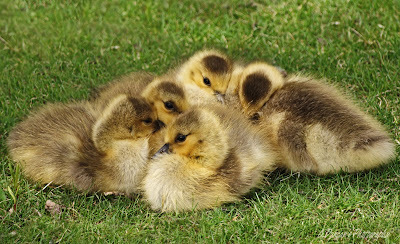 Today I thought I'd share something fuzzy and sweet though. Compliments of (insert fanfare here...) the telephoto lens. 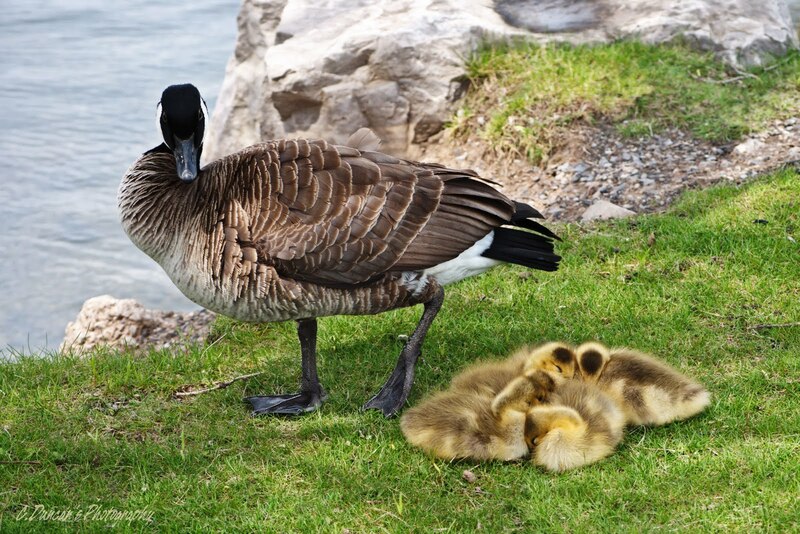 I was down at the Pier the other day, and there huddled on the lawn near the yacht club were five goslings and Mother Goose. I have a lot of respect for wildlife photographers by the way. I mean, even just to get these shots, I had to approach only when the mother looked the other way. I had to get down on all fours (in public, ahem) and I had to find a way to quickly find an uncluttered composition while metering and choosing my exposure. I can't imagine all the work that goes into photographing grizzly bears, or elusive birds of prey. 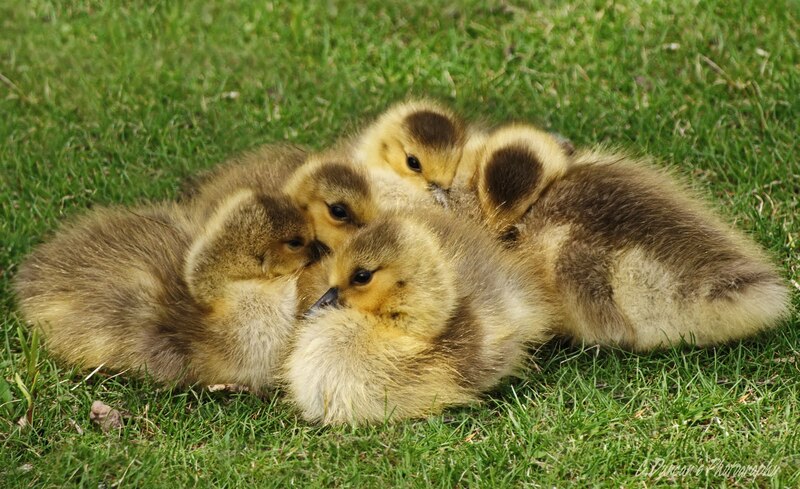 These were just geese for heavens sake! The thing is, my telephoto is really a modest lens. It's only an f.4.5 55-200mm Nikkor zoom. It's not lightning fast by any means, Nikon makes better telephotos now that reach to much nicer lengths at much faster apertures and shutter speeds. Since I wanted a decent aperture, I had to put my ISO up to 160, which is actually the perfect setting for the D80 giving no noise in lower light or shade I've discovered after using it for 2 years. The shutter speed was not ideal for rapid movement, but everyone remained fairly still in the short amount of time it took to shoot before they got tired of me. I also knew that as I moved about in the shade to recompose, my lighting would change slightly, so I kept my histogram up on my view screen which shows me which channels are exposing properly. I didn't worry so much about the green channels as I did about the blue and red channels being properly exposed due to the cool cast the shade light was giving. Working in RAW allowed me to add a stop of light if needed, and I used curves in PSPx2 to brighten the contrast a bit while keeping the color hues true to outdoor settings. Slight high pass sharpen, and the photos were done. Wasn't sure which one I liked more, so I posted both. Spring means all sorts of fuzzy critters are out and about. Try photographing some this week. And thanks for the ramble folks! Have a good one eh! Rushing Water ~ Mono Monday! Armed with a tripod, a remote shutter release, and a polarizer to filter out the excess light that comes with slower shutter speeds, I begin to hunt out the area waterfalls once again. May is truly ideal for this as we're inundated with rain from April, and Hamilton is known as the Waterfall Capitol of the World after all! 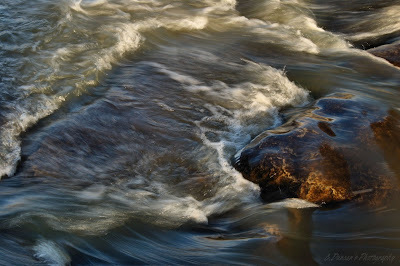 I love the challenge of photographing moving water. The trap however, is getting so caught up with the technical, that a true composition is neglected. Or we opt for any moving water that might look silky and smooth in the lens without any thought to why we're drawn to it, and how to express it as a photograph of substance. Today's B&W is my balance of the two; the mechanics of the shot, and my objective in photographing it. The first thing I was careful of was to find an element of design I could capitalize on, not just a pretty run of water. I walked around this particular juncture in the creek bed several times before I decided how much my eye kept coming back to the smooth line that arched around the creek, giving a horseshoe shape containing the water surging down over it. 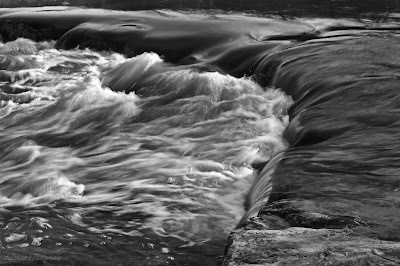 I also liked the automatic contrast of silk and surging water swirling a step below it. Exposed right, there would be a contrast of light and dark within both areas of the shot. Creates interest. 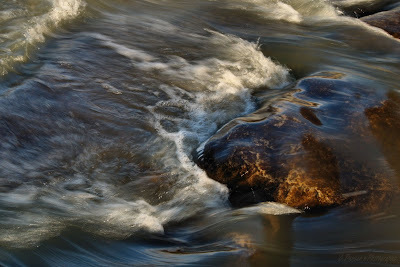 I kept my wide angle zoom on so as to include the entire rounded layer of rushing water too. Always remember your focal length (zoomed in to 46mm for this shot) helps determine what you do with your final composition, and where you'll shoot from obviously. I waited for the sun to bathe the swirling part of the water over the edge of the bank to add golden light for my color shots and to meter from that so I wouldn't blow out any necessary highlights. And I knew I'd need everything in the shot that was still, to be sharp throughout, plus use my choice of aperture to help give me a longer exposure than normal so the water would look appropriately smooth in the right spots. I ended up with a shutter speed of 1/6th of a second that gave me the look I desired. The rushing turbulent motion is still very defined in spots, and the smooth water running over the layer of rock bed is equally defined. I'm very happy with this shot. I could have easily stopped down my aperture more to allow for an even longer shutter speed and made the entire shot very very soft. But that was not my goal this time around, and at times, that approach can be very cliche. In editing after I converted to B&W, all this required was to tidy the crop a bit and pull contrast out of the shadows and highlights with PSPx3's Clarify action at only 8.6%. I'm noticing the more carefully I expose in the camera, the less is needed in editing. Maybe an obvious thing, but I use it as a way to judge if my skills are being honed any. High Pass Sharpen was applied at a subtle opacity adding a bit of extra depth. Thanks for the ramble on my waterfall trails exploits. There will be many more to come. If you haven't walked or biked the Red Hill Creek trails, they're beginning to look quite lush right now... great place for your family and your cameras! Time to Grow Again ~ Floral Friday! Flowers. If they don't grow, we can't photograph them. Obviously. Someone took the time to plant the baby rose bush in a bed, they watered it, fed it, and nurtured it. They pruned it, they trained it, and they supported it. And carefully it begins to emerge. It begins to bloom. "So where are you going with the rather obvious rose garden metaphor Christine?" you may ask. Well I'll tell you. It dawned on me the other day that I haven't learned anything new in a while. I mean pertaining to photography. Of course I read up on things, sit in on webinars (I can see them, but they can't see me... LOVE webinars.) and read all the pros blogs. But I haven't stretched myself or tried to actually utilize the new things I'm learning with my camera. It's like my motivation and my brain have been stuck on auto for the last while. So all my shots look the same, all my topics are the same, all my results are.... you get the drift. As a photographer, I have to think about my craft more. Like that rose bush. I need to plant it somewhere productive. I have to plant new ideas and techniques, and then nurture them. New ideas need to be fed... I have to get all the right info I can and then use it. I need to delve into more intense skill sets, so better and more interesting results begin to bloom. When you don't take the time to do any of that, your skills and your motivation shrivel up, fall limp, and wither. But the similarities will stop there. Because there's one big difference I need honing my craft to accomplish. I don't want to just be known for images that are pretty. I want to be known for images that had a purpose. Whether the purpose is to inspire, to teach, or to change someones ideas about art, or about the world. Just to make an impact. A tall order. I know. Guess I better get learning. Have you taken your photography, or any passion/vocation to the next level? Thanks for the ramble gang! And have a great Mother's Day Weekend as well all you Mom's out there! Trust Yourself ~ Exploration Thursday! Ever second guess your abilities? You're in the middle of a project, or a pursuit and instead of trusting your instinct you go with the more logical choice. By the time your choice is irreversible, you discover you ended up making more work for yourself than was necessary? Been there. Over that! The image today is the result of listening to oneself and trusting that you're not faking it, that you really do know a few things. We so-called "self-taught" photographers are always in danger of this mostly because we come across information about our skill, craft, and our gear somewhat haphazardly. But this point was driven home last weekend when I joined a creativeLIVE webinar and the featured Pro taught about sticking with one set of gear long enough to know all it's quirks before you ever buy anything new. And that even the most expensive cameras aren't perfect. But the longer and more steadily you use it, the more you know the best way to shoot with the gear you have. Sounds obvious doesn't it? My point is this. I've shot with my Nikon D80 long enough that I've known for forever that my camera's meter tends to underexpose scenes, even when every thing's zeroed out in the camera. When it should be perfectly metering a scene, it's always a tad darker than it should be. The problem is, I thought it was just me. That I still didn't have a handle on how to meter properly. Because? I assumed what my camera was telling me was more truthful than my gut. So much so that I was causing a lot more work for myself in post processing because I would have to spend time readjusting brightening, lightening, colors, pulling detail out of shadow... on and on and on... In reality, knowing what I know about my tricky meter (and now what I know about reciprocals, but that's another story for another post) allows me to immediately add a 1/3 to a 1/2 stop of light to get the best results immediately in the lens, and way less work in editing. And I'm all about more shooting, less editing. The image today is the newest example of this. I wanted a slow exposure of the water to smooth some of it out but still leave some bubbles intact. A long exposure time with the polarizer to slow it down more and cut reflections was key. Then straight to the computer. This has had only some minor clarify and high pass sharpening (19%) applied with the white balance tweaked in PSPx3. All because I watched my meter and slightly overexposed to get the right exposure. No extra work needed. Now the only issue is... do you like the version below which I cropped for added oomph? Or do you like the original above, with all the rushing water included to show how high and fast the creek bed was last night? Thanks for the ramble, I'll anxiously be awaiting your opinions? But in the end, I'll go with my gut. Have a super Thursday! "High Water Creek ~ Cropped Version"
Seas of Tulips! ~ Telephoto Tuesday! It's that time of year! That time of year when I pack my kit bag and spend an entire day photographing tulips! Ah. Just thinking about it makes me so happy I could do back flips. But I won't, I'll save us all the embarrassment and the ride in the special truck with big flashing lights on it. Ahem. That's right, it's time for the Royal Botanical Garden's Tulip Festival! 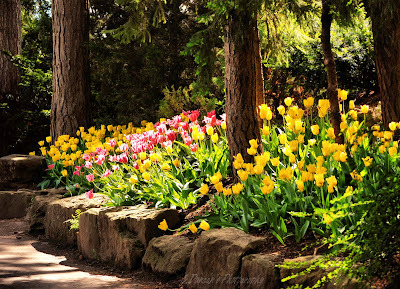 Within the next two weeks, the rock gardens at the RBG will be filled with an amazing display of color and exotic species of tulip from around the world. And about the same time, give or take a week, the flowering trees will put on an equally brilliant display from the gardens to the magical arboretum. And then it's full tilt from there, I'll return to the RBG with my camera for the entire rest of the year, for the peonies, the iris festival, the roses, and the fall color. But the Tulip Celebration starts it all off. I really will be in my glory. I step into that glorious garden of color and announce "The Nikonator returns!" Rain or shine I go... in the rain you get your shallowest lenses out and photograph those classic rain drop shots, and the colors are saturated nicely. Sunshine is fine too, the rock gardens have wandering paths totally shaded over and hidden from the harsh light... if you have never been, and you live in Ontario, you really need to visit the RBG, you'll be hooked. Thanks for the community billboard type ramble today folks, and have a good one! Let's get out there and greet Spring! I love old architecture and buildings with a story. And I love to shoot them in sepia or B&W. But I know you've noticed that already. This coming weekend is not only Mother's Day but for the Hamilton community it's our annual Doors Open Hamilton event. 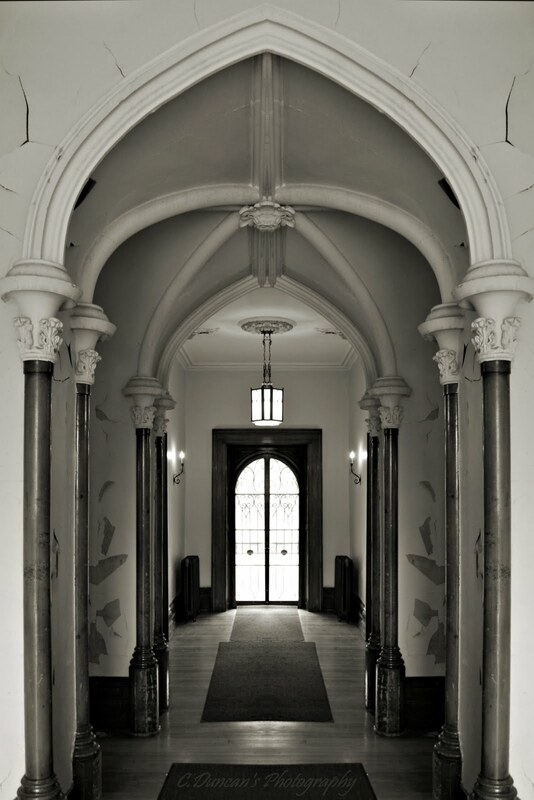 It's basic idea is properties and buildings that aren't usually open to the public open their doors for an entire weekend to be explored and viewed and photographed for free. I attended for the first time last year and it was terrific. Not just the photo ops, but the history and the knowledge the volunteers had at their disposal. 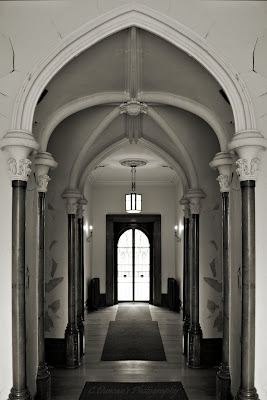 The images today are from Auchmar Manor. It is slowly being restored to it's former glory by donations and volunteers from the city. It has a very interesting history. 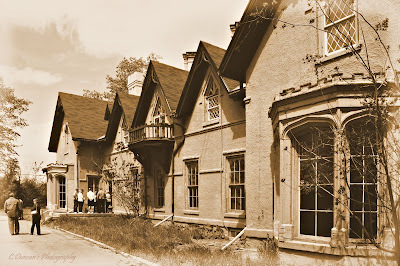 Built in 1855 by the Honorable Isaac Buchanan, and named in honor of his place of birth in Scotland, this was the first extensive property to top the escarpment, and contained an orchard, stables, carriage house and a ballroom within the manor. He helped establish the city with the railway, was friends with Sir Allen MacNab, and was a powerful civic leader. Later on the manor became a military headquarters for a time, and has had many a TV show and movie filmed within the property. But now it's time for restoration. Their hope is for it to become another National Historic Landmark and protected for many years to come for the public to enjoy. 1) Go wide. My 18-55mm kit lens was just the tip of the iceberg. Some of these buildings have very little space or really awkward spaces so that powerful telephoto you have won't do you any good except for the odd details shot. If you go wide, you'll be able to get the interiors entirely in your frame. 2) Be wary of the light. The older the building, the less light you seem to have to shoot with. Cavernous rooms made of stone will need long exposures, sometimes not possible with the flow of people wandering through, and smaller rooms will need a hot shoe flash to add extra light to dark corners or hidden passageways. 3) Be prepared to photograph the gardens. 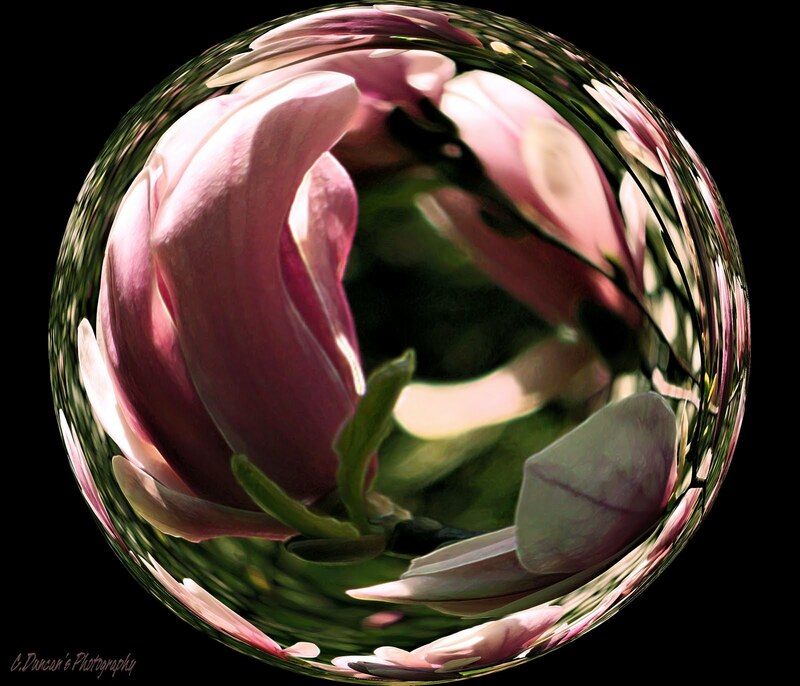 Spring flowers, orchards, or nearby trails in some locations all give the opportunity to photograph some nature. I saw many a macro user out in the gardens at a few locations shooting tiny buds, rain drops on magnolias, and crab apple trees about to pop. 4) Lastly, get all those imperfect details. Crown molding and cornices with flaking paint. A rustic table where they're explaining tools from time gone past. Stonework, old windows with a cobweb, or gleaming woodwork and candles in the churches. They all make for great ways to practice your photography skills. And aren't things you get to see everyday. So this weekend, if you're in the area, take a historical ramble through the city. Take your family. Then take mom out for a nice lunch. Then offer to clean her house for a week. No, really... stop laughing. Thanks for the ramble folks! Have a good one, and get out there and explore your own city.